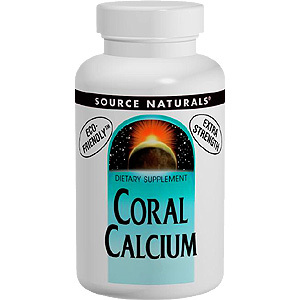 Coral calcium contains the alkaline minerals, calcium, magnesium and other essential trace minerals. An initial study on an alkaline mineral blend demonstrated an increase in blood alkalinity (pH) and buffering capacity. Proper alkalinity (pH) of the blood is critical for the overall health of the body. Even slight pH variations - that is, more acidity - can result in imbalances such as candida, indigestion, seasonal sensitivities, and low immune function. Source Naturals Coral Calcium is Eco-Friendly. Unlike ocean-harvested coral calcium, it is harvested from an above-sea source: fossilized coral on the coral island of Okinawa. Source Naturals Coral Calcium is HYPOALLERGENIC: contains no yeast, dairy, egg, gluten, corn, soy or wheat. Contains no sugar, starch, salt, preservatives, or artificial color, flavor or fragrance. Warning: If you are pregnant or breastfeeding, consult your health care professional before using Coral calcium product. Vitamin D-3 (as cholecalciferol) 400 IU, Calcium (naturally occurring) 420 mg, Magnesium (naturally occurring) 8 mg, Coral Calcium 1.2 g.
Coral Calcium 1200 mg is shipped in a discrete, unmarked package. Orders are processed immediately and usually take about 3 to 5 working days to be received. We do ask that you try it for 2 to 3 weeks to feel the full effects. Any information received is used only for order processing and shipping purposes. Your information, such as e-mail address, will never be disclosed to a third party.